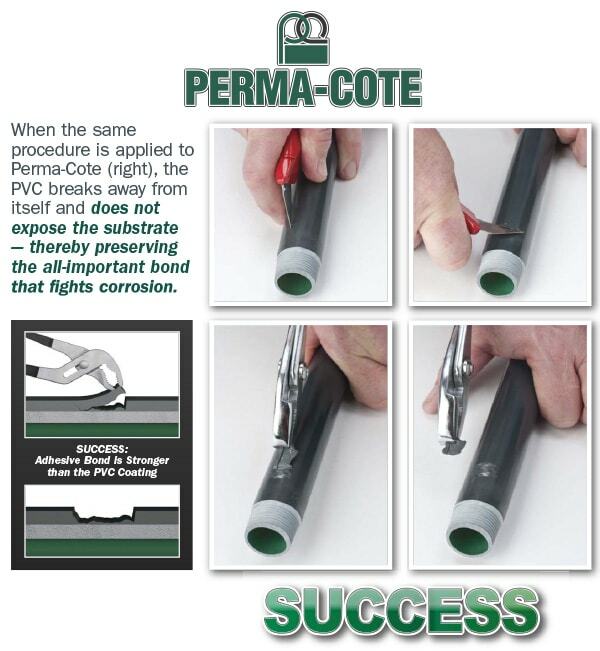 Perma-Cote PVC-Coated Conduit – Protecting the oil & gas industry for more than half a century! Corrosion causes more than $1 trillion dollars of damage every year. NACE International estimates that annual corrosion costs, specific to the oil and gas industry in the United States are alone, are as high as $27 billion. Experts in corrosion analysis have estimated that the annual global cost of corrosion in the oil and gas industry copuld exceed $60 billion. Of all the factors that contribute to a failure in offshore oil and gas structures, corrosion is number one. 5 metric tons of steel degenerate every second worldwide and 40% of all produced steel is used to replace steel that has corroded. 60% of the worldwide offshore operations are past the theoretical design age of 20 years, 6,000 of which are stationary platforms that cannot be moved. Offshore corrosion maintenance is 15 – 20 times more costly than performing work at a yard and can account for 60% of offshore maintenance costs. Of nearly a half million miles of oil and liquid gas transmission lines, approximately 60% are more than 20 years old and vulnerable to corrosion. Material and labor costs of replacing failed products, including those not providing reliable protection against corrosion, can consume upwards of 50% of facility budgets. Because of the facts above it is increasingly vital that the oil and gas industry designs, builds and maintains facilities that perform as needed for the long term. A study by the Executive Branch and Government Accountability Office underscores the fact that although corrosion cannot be eliminated — it can be prevented — and doing so could eliminate more than 40% of the costs of current corrosion damage! A superior-performance product, such as Perma-Cote, even though it may be a small element of any given job, can be instrumental in ensuring protection of entire oil and gas systems from corrosion. 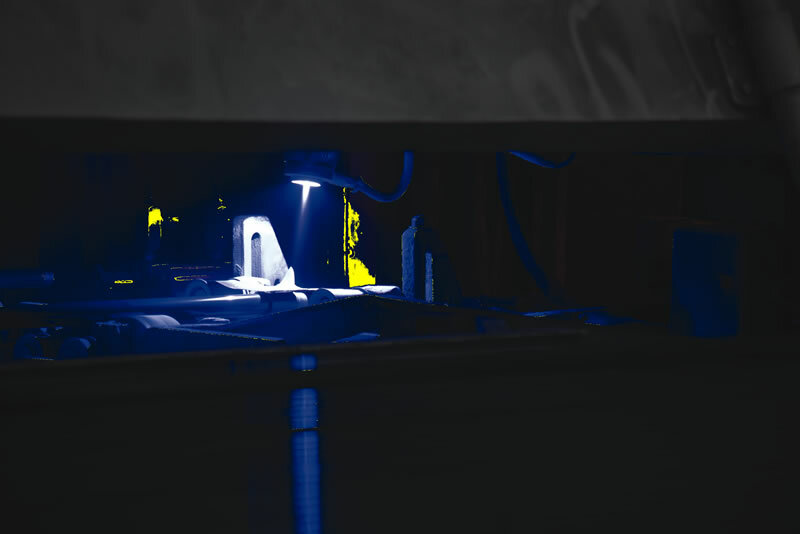 Perma-Cote can help reduce downtimes by 50% or more and can contribute to extended service life by more than 10 times that of other product options. By eliminating product failure you eliminate the staggering costs of downtime, safety hazards, replacement costs, and related liabilities. Every dollar has to count or the problem will continue to grow. That’s why a corrosion prevention strategy is necessary. That’s why good partners in the fight against corrosion are equally necessary. Perma-Cote PVC-coated galvanized, rigid conduit proven by independent product testing to provide more than 10 times longer reliable service life! All major brands of PVC-coated galvanized rigid conduit meet exactly the same standards established in UL, and are authorized to carry an identical UL listing label for PVC- coated galvanized rigid conduit. However — not all brands are ETL PVC-001 Verified. Perma-Cote is. Others are not. Why is this of critical importance? UL6 is an important standard that addresses safety for rigid metal conduit. It is not, however, a performance standard. ETL PVC-001 Verified is an internationally recognized listing based on performance evaluations and on predicting service life. On the basis of independent, objective product comparisons by ETL, Perma-Cote has been proven to provide ten or more times the protective service life of brands that are not authorized to carry the ETL PVC-001 label. 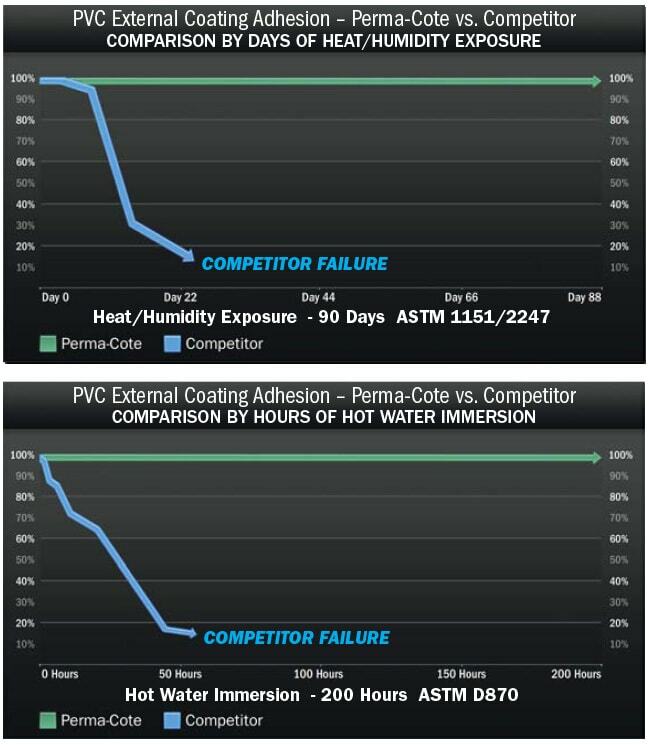 ETL PVC-001 validates the coating performance of PVC-coated galvanized rigid conduit based on ASTM D870 and ASTM D1151/ASTM D2247 — the accepted ASTM tests for predicting product service life of a coating under the two most common conditions that affect adhesive bonds: heat and humidity. As one of the original authors of NEMA RN-1 we thoroughly understand and conform to the voluntary, non-regulated guidelines of this standard. This is especially true with regard to how we prepare the zinc surface of conduit to enable a degree of coating adhesion not achieved by other manufacturers. Not all PVC-coated conduit is created equal. In fact, none can equal the proven performance of Perma-Cote. This unsurpassed level of protection is achieved while still providing you a product that is cost-effective with all other brand options — but guaranteed to provide you the corrosion resistance you paid for! 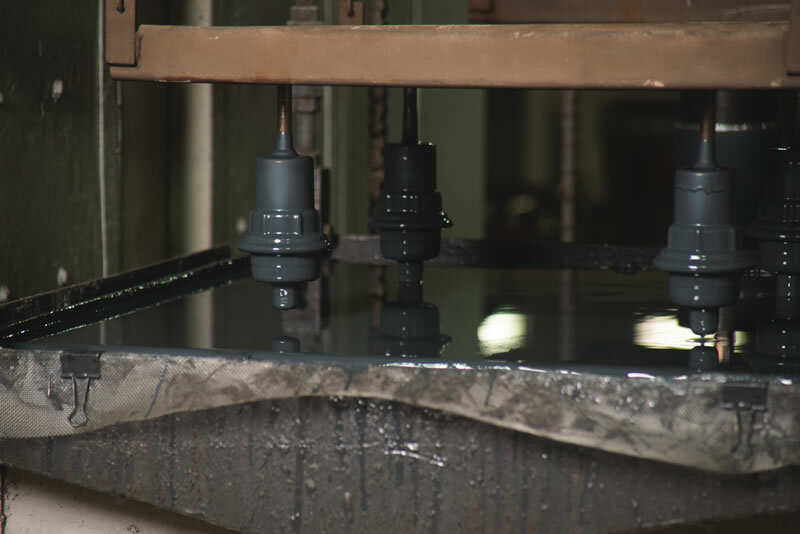 Perma-Cote successfully fights corrosion in oil & gas environments because our coating adheres. Not all brands can make that claim. Need proof? Seeing is believing. 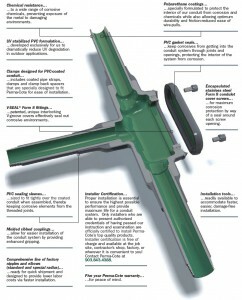 Adhesion of the 40-mil coating on PVC-coated conduit is key when protecting against corrosion. If the coating “sticks” the product works. If the coating doesn’t stick — the product fails. In side-by-side performance comparisons these two conduit samples were exposed for the same number of test hours in boiling water. ASTM-accepted accelerated tests in environments such as boiling water clearly differentiate which coatings perform best. Perma-Cote has been proven reliable even in such extreme environments, so imagine how well it will perform in diverse on-the-job applications. 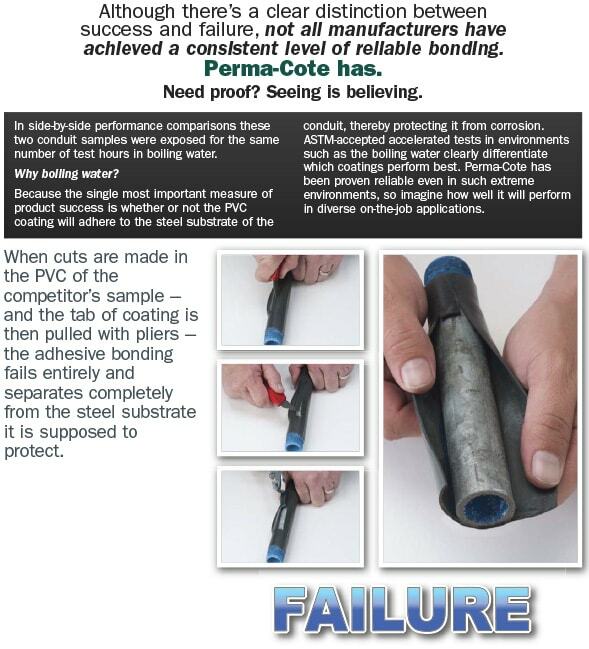 When cuts are made in the PVC of the competitor’s sample — and the tab of coating is then pulled with pliers — the adhesive bonding fails entirely and separates completely from the steel substrate it is supposed to protect. When the same procedure is applied to Perma-Cote, the PVC breaks away from itself and does not expose the substrate — thereby preserving the all-important bond that fights corrosion. Perma-Cote – proof through performance in actual oil & gas job applications. o Pumping Stations, Compression Stations, and Metering Stations. The soils itself tend to be acidic, but additionally it is used for the added security measure that it will provide longevity to the stations so that there is no loss of service or production. It is also used on offshore platforms in order to protect from the salt water environment. o Offshore Platforms: Due to the marine environment (salt water/chlorides) PVC Coated aluminum is available as a lighter weight metal is desired for offshore platforms.